Today, I once again woke up early, packed up my things and had breakfast. I waited around all morning for news that the military clearance had been received and at 12:30pm, finally got it. We hurried to the jeep, secured our duffels to the roof, and crowded into the car. A police officer joined us in Skardu, meaning four people had to be jammed into a seat meant for three, but thankfully he left about 45 minutes in. It rained the entire way, causing some rock fall to hit the jeep and making river crossings a bit scary, but we were happy to be out of Skardu and on our way to base camp. We stopped at the military checkpost and waited for all of the jeeps to arrive with everyone on our permit from other agencies. I was shocked at how many familiar faces I saw arriving. Juanito Orizabol and Alberto (Basque) were heading to Broad Peak. Cleo Weidlich was heading to K2 for another attempt on the Cesan route. 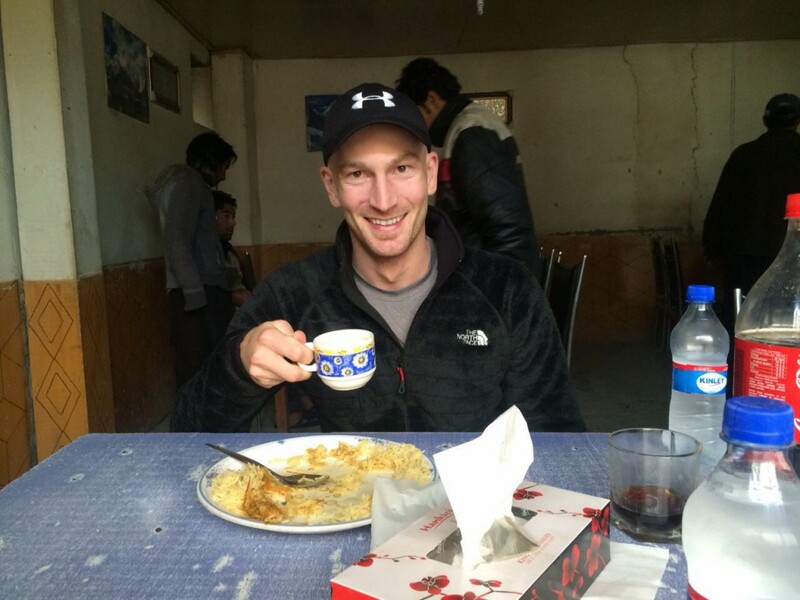 Simone la Terra was attempting GI and of course the Czech and Hungarians from Broad Peak were heading to K2. We said our hellos and waited impatiently for the ok to pass, as it was already extremely late to be on the road. We finally got the go-ahead and continued on the jeep track toward Askole. The bridge that had been broken last year after my Broad Peak expedition had been repaired, however, not far from that bridge, another had broken and we were forced to cross it by foot and ferry our duffels across to another set of jeeps waiting on the other side. After 7.5 hours in the jeeps, we finally arrived at dusk to Askole. It was still raining, meaning that everything was soaking wet. Thankfully, Akbar, my cook, had arrived the day before and had already set up the kitchen tent and my personal tent, which I was very grateful for. I ate dinner with the Czech, whose kitchen had yet to be set up, unpacked my equipment into my tent, and got an early night.